Bristol Natural History Consortium is delighted to announce their success in securing the stunning and inspiring Earth from the Air Exhibition for the Festival of Nature, hosted by At-Bristol in it's public squares and spaces this October. The National Tour, supported by Birds Eye and regional support from At-Bristol and the University of the West of England, the exhibition of 120 giant-sized aerial photographs will be displayed around At-Bristol’s Millennium Square and Anchor Square in the heart of the city, forming part of Bristol Festival of Nature. Launching on 9th October, the images, each one 2m x 1.5m in size, are expected to attract thousands of visitors and capture the attention of shoppers, workers and visitors in the centre of the city during its three month stay. Following its extended run in the grounds of the Natural History Museum in London, ‘Earth from the Air – A Photographic Portrait of the Planet’ will be visiting Bristol on its National Tour. This large outdoor gallery with a major photographic exhibition will enjoy free public access 24-hours every day. The French photographer, Yann Arthus-Bertrand has assembled the stunning collection of aerial photographs which illustrate the beauty and fragility of the natural world. It took him over 14 years of field work, flying over 76 countries and 100,000 shots to capture the astonishing images. Each one tells a story of its own.The exhibition will also feature a walk-on map of the world, so visitors can see where the photographs were taken, as well as jump from country to country. Professor John Durant, At-Bristol's chief executive and chair of Bristol Natural History Consortium tells us "Earth from the Air is an extraordinary photographic portrait of our endangered planet. At-Bristol is delighted to be hosting this breathtaking exhibition as part of the Bristol Festival of Nature. We hope many thousands of people will visit and enjoy Earth from the Air in Millennium Square." UWE Pro-Vice Chancellor - Colin Fudge "This is excellent news; the University of the West of England is pleased to provide sponsorship for this stunning exhibition. It is particularly pleasing that the exhibition is free so that all can enjoy this visual record of our planet. Our University has an active portfolio of degree programmes, short courses and research on a wide range of environmental topics, and specialises in the public understanding of science. UWE is also sponsoring the Bristol Festival of Nature 2004 and we look forward to working with partners to make both of these events a success." The Earth from the Air exhibition forms part of Bristol Festival of Nature – the UK’s biggest celebration of the natural world, taking place between 9 – 31 October 2004. The three-week programme of ambitious and inspiring events includes films, animal encounters, exhibitions, walks, talks, workshops and competitions for all ages and interests. The exhibition will then remain with the host, At-Bristol, until January 2005. Further details can be found by visiting www.festivalofnature.org, e-mail: info@festivalofnature.org or call 0117 915 7235. For more information please contact Annabel Iles in the At-Bristol press office. A selection of FREE images are available from press@earthfromtheair.com contact Kate Smith on 020 7336 0298. Bristol Natural History Consortium is a collaboration between At-Bristol, BBC, Bristol Zoo Gardens, University of Bristol, University of the West of England, The Wildscreen Trust and WWF-UK. This alliance aims to demonstrate that taking action towards conserving the natural world is easy, fun and rewarding. A public festival offering unique opportunities to enjoy the wonders of our natural world through an ambitious and imaginative programme of films, animal encounters, exhibitions, walks, talks, workshops and competitions. Visitors will find out how we can all help look after our planet’s natural assets and celebrate Bristol’s international reputation as a leading centre for the understanding and appreciation of the natural world. Many of the events will be free of charge. The conference will bring together a cross-section of professional and visionary communicators to share experience, challenge current practice and examine new ways of communicating about our natural world and the need for its conservation. Stunning aerial photographs taken over 100 countries to record the state of the planet will take visitors to the Royal Botanic Garden Edinburgh around the world in 120 ways. The Birds Eye sponsored national tour of Earth from the Air ñ a photographic portrait of our planet by Yann Arthus-Bertrand opens this weekend at the Royal Botanic Garden in Edinburgh. Part of the Scottish Executiveís Entente Cordiale celebrations the exhibition features 120 giant-sized aerial photos (2x2.5m in size) taken by the world famous French photographer. The images were all taken from a helicopter - sometimes only 50 feet from the ground - capture the beauty and fragility of the world today. They were taken by Yann over 14 years during which time he has taken over 100,000 photographs. The free exhibition is expected to become a major attraction in the city for the next two months and is providing what the organisers describe as the ìultimate chill-out zoneî for festival goers. The exhibition, which has converted a large area in the garden into an open-air gallery, has been a huge success since it first opened at the Natural History Museum in London and was seen by over 4 million people. Environment and Rural Development Minister Ross Finnie said: ìI am delighted that the Scottish Executive is supporting this exhibition, and that it features in our entente cordiale celebrations. The photographs speak for themselves - they are very effective in highlighting some serious and important environmental issues across the globe, and defining human impact on our environment, showing exactly why we are taking action. I congratulate Yann Arthus-Bertrand for his dedication and inspiration. Dates: July 31st  September 26th 2004 Opening times: 10.00am-19.00pm daily. Venue: Royal Botanic Garden Edinburgh. Birds Eye, Britains number one grocery brand, is supporting the inspiring Earth from the Air exhibition during the remainder of this year and 2005. This critically acclaimed exhibition shows a series of breath-taking environmental photographs from the around the world. The national exhibition tour starts in July 2004 and will appear at three major cities in the UK. The Earth from the Air exhibition shows just how beautiful the Earth is and why we should all work harder to look after it. "I am personally very excited about Birds Eyes involvement with Earth from the Air", says Birds Eyes Brand Director, Jerry Wright. "Its a great example of capturing the best of nature, which is also Birds Eyes philosophy for its food. Birds Eye is dedicated to ensuring consumers get great tasting, natural food"
Birds Eye also takes its environmental responsibilities seriously too and has been taking steps towards more sustainable practices. For example, it has introduced sustainable fish species into its range and reduced levels of pesticides and herbicides in its pea fields. Birds Eye is undergoing massive changes this year starting with a new and exciting logo. Alongside this, big steps have been taken to ensure that Birds Eye is leading the way when it comes to food issues and product innovation. For example, all its meals provide less than one third of the FSA advice on daily salt intake for adults. More than £4 million and 20,000 man-hours have recently been invested to ensure that all products within the Birds Eye portfolio only contain ingredients you can find in your store cupboard at home. This initiative means that consumers can rest assured that they are only eating the most wholesome and nutritious food, straight from the freezer. The new-look Birds Eye brand will continue to target people who care about food  families who are busy but dont want to compromise on quality and taste. New varieties of steamed vegetables and a new range of steamed fish recipes are being launched this summer in a continued bid to bring great tasting, wholesome and contemporary food to our tables. The brands team of chefs is also developing new recipes and ranges ready for launch into stores later this year. The organisers of a major free photographic exhibition have just 48 hours to transform part of the city centre of Birmingham into a huge outdoor gallery. The Earth from the Air  a photographic portrait of our planet by Yann Arthus-Bertrand will be a feature of the city this summer making Victoria Square, Chamberlain Square and Centenary Square home to an extraordinary gallery of giant-sized aerial photographs from around the world. The operation to build the exhibition can only begin after the final whistle has blown in the European Cup Final when the space will become available to use. "The centre of Birmingham has been focusing on Europe for the last month. From Tuesday it will be taking a look at the whole world" said Chris Bridge, the exhibition Director. "This really is quite a challenge. It is a large and complex operation and it would normally take us up to five days to erect." With the expertise and experience of the Birmingham City Events management team the open spaces in the squares will have yet another new look. Chris added "To be ready for the opening a team of specialists is going to be working through the night from Sunday to construct the stands, display the large images and lay a giant walk-on map of the world so were ready for the opening on Tuesday evening. We simply have to be ready, but it is a race against time." The free exhibition of 150 giant-sized aerial photographs is set to become a major attraction for visitors to the centre of Birmingham throughout the summer. It is staring a national tour in Birmingham, having already been the most popular free exhibition in London where it was seen by over 4 million people at the Natural History Museum. The French photographer, Yann Arthus-Bertrand has assembled the stunning collection of aerial photographs which illustrate the beauty and fragility of the natural world. It took him over 14 years field work, flying over 76 countries to capture the astonishing images. Each one tells a story of its own. The exhibition will also feature a walk-on map of the world, so visitors can see where the photographs were taken, as well as jump from country to country. Blind and visually impaired visitors can also appreciate the images in a pioneering display of tactile panels, which have been specially produced by French designer Alain Mikli. The National Tour has been made possible by the generous support of Birds Eye, Britains number one grocery brand. The Earth from the Air exhibition became one of the most popular outside exhibitions in London during its showing, and now its set to become one of the most popular touring FREE exhibitions. Earth from the Air exhibition heads nationwide thanks to Birds Eye! Following its hugely successful extended run in the gardens outside the Natural History Museum in London, the exhibition Earth from the Air  A photographic portrait of our planet is beginning a two year national tour of the UK. The stunning photographs in the Earth from the Air exhibition demonstrate visibly how human activity has left an imprint. The impact of population growth and technological progress on the planet has been dramatic, particularly over the last 50 years, and the worlds landscapes have been transformed as a result. The photographs are a record of what changes the globalised industrial economy has wrought. The new tour, which includes Birmingham, Edinburgh and Bristol, has been made possible thanks to the generous support of Birds Eye, Britains number one grocery brand. Chris Bridge, Exhibition Director, is excited by Birds Eyes participation: "Businesses have an important part to play in climate change and sustainability. A measure of their corporate responsibility is the support they can make to addressing these key issues. Birds Eye is demonstrating its commitment in supporting Earth from the Airs national tour. Thanks to its generosity, this exhibition will now be seen by people young and old across the country. Visiting the exhibition will entertain people, stimulate them and engage them in the issues - all for free and all in the fresh air." Jerry Wright, Brand Director for Birds Eye is delighted, too: "This inspiring and educational exhibition represents a great example of capturing the best of nature, which is our philosophy for Birds Eye food. It celebrates the beauty and power of nature and inspires us to value and protect our environment. At Birds Eye, we believe the natural way is the best way. Thats why weve introduced sustainable fish species into our range and reduced the use of pesticides and herbicides in our pea fields and why we never use artificial colours or flavours in our products." The Earth from the Air UK national tour exhibition supported by Birds Eye will hold an official opening in Birmingham City Centre, on July 6th. The exhibition is due to remain until the autumn, with an additional exhibition opening in Edinburghs Royal Botanic Gardens for the Edinburgh Festival. The exhibition will then take centre stage at the Bristol Festival of Nature, and will be sited in Bristols Millennium Square and Anchor Square. Having proved its popularity during two years in London, the Earth from the Air exhibition is expected to become one of the most popular touring FREE exhibitions in the Britain, attracting hundred of thousands of visitors. 6th October - @Bristol, Bristol. Parts of the city centre of Birmingham are to be transformed into a large outdoor gallery this summer with the arrival of a major photographic exhibition "EARTH FROM THE AIR  a photographic portrait of our planet" by world famous photographer Yann Arthus-Bertrand. Opening on July 6th the free exhibition of 120 giant-sized aerial photographs will be displayed around the hoarding of the Town Hall, Victoria Square, Chamberlain Square and Centenary Square in the heart of Birmingham. The organisers say the images, each one 2.5m x 2m in size, are expected to attract thousands of visitors and capture the attention of shoppers and workers in the centre of the city. Birmingham is the first city of a national tour after the exhibitions huge success in the gardens of Londons Natural History Museum where it was seen by an estimated 4 million people. Val Birchall, Birmingham City Council's Head of Arts Team, said: "Birmingham is delighted to host such an innovative exhibition. It complements the Council's drive to use the city's public spaces in an imaginative way throughout the year to engage visitors and residents of all ages in a variety of sports, arts and cultural events." Exhibition Director Chris Bridge said, "We are delighted to be able to launch our national tour in Birmingham. The photos appeal to all ages and tell a story about our world, the environment and our impact on it." The National Tour has been made possible by the generous support of Birds Eye, Britains number one grocery brand. Jerry Wright, Brand Director for Birds Eye commented: "We are delighted to be supporting the Earth from the Air national tour for the next 18 months. The exhibition is both inspiring and educational and it represents a great example of capturing the best of nature, which is our philosophy for Birds Eye food." The Earth from the Air exhibition became one of the most popular outside exhibitions in London during its showing, and now its set to become one of the most popular touring FREE exhibitions. At the Photocall a choir of 26 blind children from Sierra Leone will sing during a visit they are making to the exhibition. It is the start of their UK tour. Many of the children were blinded during their countrys brutal civil war. They are coming to this aerial photographic exhibition because it is pioneering a new technological application that allows them to experience the pictures through detailed tactile panels. Photos of Sierra Leone are included in the exhibition. The Milton Margai School for the Blind in Freetown, Sierra Leone, is visiting Britain during which they will be singing at several venues and concerts. The school was badly damaged in January 1999 when in the space of 10 days 7,000 people in Freetown were murdered and thousands more mutilated and raped. A number of the pupils were blinded by the rebels and many others were affected by loss of family members. The choir is regarded as Sierra Leones finest, a remarkable achievement considering the turmoil it has faced in the 11-year civil war. The children, aged between 8 and 18 years old are coming to Earth from the Air now it can be experienced by blind people through pioneering tactile panels. They have been developed by Alain Mikli, the French optical designer, in collaboration with the photographer Yann Arthus-Bertrand. Blind Childrens Choir members about their lives and what the new tactile pictures mean to them. At the Photocall blind and partially sighted visitors to a photographic exhibition will be using innovative tactile panels that allow them to experience aerial photographs in great detail using their hands to interpret pictures that have been scanned and etched in relief on specially developed cellulose acetate panels. Blind and partially sighted people will be able to see Yanns astonishing aerial photography for the first time. The Photo Call is the first opportunity world-wide to see a pioneering technological application that its creators believe could make a substantial impact on the way blind people can interpret the world through tactile images. A series of 30 aerial photographs taken by celebrated photographer Yann Arthus-Bertrand, currently part of his large-scale out-door exhibition at the venue, have been interpreted as Tactile Pictures so they can be appreciated by blind and partially sighted people. A set of pictures and text accompany the tactile panels will allow friends to share and discuss the work. The technique used is innovative. Black and white layers of a natural plastic - Cellulose Acetate - have been bonded together and the original photo etched onto it to create tactile pictures that describe the landscapes in astonishing detail. The project has been achieved by a unique partnership between the photographer and world-famous Optical and Glasses designer Alain Mikli. It is hoped this first use of the technique could lead to far wider applications for visual interpretation. Experts on technologies for visually impaired people. Visually impaired users who will be reviewing the exhibition and the new tactile pictures. Donations boost African Water projects for AMREF. Every time we sell a bottle of our special Earth from the Air water, a donation goes to Amref, which is committed to providing safe drinking water to communities throughout Africa. Also we are raising vital awareness for Amref and their sustainable projects. So far our exhibition has helped raise an incredible £21,500. Thank you. If you are organising an event, we can supply our Earth from the Air water and youll be doing something positive to help reduce deaths from waterborne diseases. Contact theshop@earthfromtheir.com. If you have been in Central London recently youll have seen large Earth from the Air images and captions filling the shop windows in several Prêt a Manger cafes. Theyre helping promote the exhibition and its sustainable message. Our Valentines Day Love Our World campaign sent thousands of Valentines day E-Cards from www.earthfromtheair.com and made the website one of the big hits on the web for February. It has helped spread our message and we hope created some fun too. Of course New York has been photographed a million times before, but through Yanns lens, this collection of aerial photos captures New York as you have never seen it before. Yanns latest updated book is now available exclusively at our Earth from the Air shop at the London exhibition and at a pre publication price of only £20. OK, heres an admission. Yanns Earth from the Air book is big, and heavy. The new revised version has over 207 colour pictures and new chapters. So, weve introduced a special UK HOME DELIVERY SERVICE from our shop at the exhibition. Best of all, whatever else you buy or up to 24kg is sent for no extra delivery cost. For details contact our shop 0207 942 5937. In the next few weeks, due to many requests from visitors, we are launching ONLINE SHOPPING www.earthfromtheair.com, so if you missed buying a catalogue, book, poster or T-Shirt at the exhibition, you can order at the click of a mouse. The exhibition is presented by wecommunic8 and Impact Photos is association with The Natural History Museum. Earth from the Air and Earth from the Air 365 Days are internationally best-selling books published, by Thames & Hudson in the UK and simultaneously in 14 different languages. The Natural History Museum is one of the UKs top visitor attractions and a world-leading science research centre. Through its collections and scientific expertise, the Museum is helping to conserve the extraordinary richness and diversity of the natural world with ground-breaking projects in 68 countries. The Museum is committed to promoting public understanding of science. This will be greatly enhanced by the Darwin Centre, a major new initiative, which will offer visitors unique access behind the scenes of the Museum. Phase One of the project will open to the public in September 2002. Yann Arthus-Bertrand talks about the EARTH FROM THE AIR exhibition; its impact and how he works on location to capture the images on camera. Visitors to the Earth from the Air exhibition of aerial photographs by Yann Arthus-Bertrand at The Natural History Museum in London are helping to provide safe drinking water to communities in Africa. The organisers, Wecommunic8, are giving a donation from the sale of specially labelled Earth from the Air water to AMREF, Africas Flying Doctors, to provide help for villages needing healthy drinking water. The free outdoor exhibition in the gardens of the Museum has already been visited by hundreds of thousands of people. Earth from the Air is a series of 150 stunning aerial photographs of natural and man-made landscapes captured by the French photographer who flew over 100 countries, including many on the African continent. Chris Bridge, Director of Wecommunic8, said "The exhibition has a strong message about sustainable development and the environment. Weve found people coming to the exhibition are inspired to do something positive whilst theyre there. They dont want to rely on big world meetings like the Earth Summit in Johannesburg to provide whats needed, they want to do something straight away themselves." Last century, the planets population was multiplied by 3 - World water consumption was multiplied by 6. The idea came from a conversation between Chris Bridge and Yann Arthus-Bertrand as they discussed the project. "He told me he had first discovered aerial photography when he flew over the Masai Maara Reserve in Kenya with one of the pioneers of Flying Doctors Anne Spore. I just thought, hey, this is a great way for visitors to help make a difference." AMREFs Flying Doctors work with communities to help them secure safe drinking water and run education programmes to reduce the impact of water-borne diseases such as Cholera. Speaking about the partnership, AMREFs Deputy Director Gordon Owles said "Were delighted to be linked to this wonderful exhibition especially at a time when parts of Africa are desperately short of water and world attention is focused on the problem"
The bottled water, which is supplied by Watermedia, has a specially designed label using an exhibition image of a heart-shaped natural break in a mangrove forest in New Caledonia. The organisation will be getting 10p for every bottle sold. Earth from the Air is showing its commitment to sustainability by introducing biodegradable carrier bags to the on-site shop. Believe it or not carrier bags can take up to 500 years to degrade. So if Henry V111 had thrown one away it would still be here today. Coming next month our new special bags will bio degrade after only 12 months. World Lovers do it naturally! The EARTH FROM THE AIR exhibition at The Natural History Museum in London is offering an opportunity for romantics to show they are "World Lovers" this Valentines Day. The exhibition is lending its most famous photograph of a naturally-formed "Heart" motif to lovers everywhere to send their own personal Valentine messages. Visitors to the Earth from the Air website (www.earthfromtheir.com) will be able to write an E-Valentine Card using the natural "Heart" photograph for despatch on February 14th. Chris Bridge of Earth from the Air Ltd., said "Its got great appeal for anyone who cares about the world we all live in. And its simple, sustainable and free! There is also an opportunity for Valentines to rendezvous at the giant-sized image of the "Heart" at the exhibition in the gardens of The Natural History Museum, South Kensington, London. The site is floodlit at night and creates an especially romantic atmosphere. "This is a staggeringly beautiful collection of aerial photographs which are really inspiring. They also show that what the world needs is love. In short, they tells us we need to be world lovers." "Valentines day is the perfect day to show a bit of hope for the future. To say we can make a difference. Our website and the exhibition are simply great places to start. We think its a chance to switch from a red heart to a natural one." Earth from the Air  a photographic portrait of our planet by Yann Arthus-Bertrand is a stunning presentation of 150 giant-sized aerial photographs of the natural and man-made world. It is estimated that since it opened in June 2002 Earth from the Air has been seen by a million people. Its popularity means that the original three-month run has been extended until October 2003, so it will continue to be one of the MUST SEE exhibitions in London. The hugely successful outdoor exhibition Earth from the Air has re-opened at The Natural History Museum for an extended run. It will remain in the east gardens until Autumn 2003. Earth from the Air  A Photographic Portrait of Our Planet, by celebrated French aerial photographer Yann Arthus-Bertrand, is a selection of images from his astonishing photographic project to create a visual record of the state of our planet today. The exhibition features 150 images  each over two metres across  in an area the size of half a football pitch together with a giant walk-on map of the world. The exhibition has been specially designed for all weather conditions and has floodlighting to allow viewing during the shorter winter days and into the evening. The exhibition has also been modified to fit a new space, created when building work began on part of the original site. The new design includes an enlarged tented DVD theatre space and information area. Open from 10.00 until 20.00 seven days a week, Earth from the Air is a free exhibition. The huge success of the exhibition Earth from the Air: a photographic portrait of our planet by Yann Arthus-Bertrand has led to the organizers extending its run until December this year. The outdoor gallery of aerial photographs  which is half the size of a football pitch is being relocated within the gardens of The Natural History Museum and will re-open on Monday 4th November 2002. Already seen by almost a million people since it opened on June 20th, the exhibition features 150 aerial photographs taken by the famous French photographer in 76 countries. The exhibition presents the images in giant-sized format, with each photograph over almost 3 metres in height. Visitors can also "stride across the surface of the earth" on a large-scale walk-on map of the world. The exhibition will be open from 10am until 8pm in the evening, allowing visitors to see the images under atmospheric lighting at night. 15 September 2002 will be the last chance to catch a special exhibition at The Natural History Museum. Earth from the Air, which celebrates the earths natural beauty and diversity. Earth from the Air  A Photographic Portrait of Our Planet, by celebrated French aerial photographer Yann Arthus-Bertrand, has been the first ever outdoor exhibition at The Natural History Museum. This astonishing photographic project is a visual record of the state of our planet today featuring 150 images  each over two metres across  and a giant walk-on map of the world. Open until 10pm seven days a week, Earth from the Air has attracted tens of thousands of visitors of all ages during its three-month run. Get a really different view of the world! Have you ever wondered what it would be like to fly over the world and see the planet from the air? Well you can - at an amazing exhibition that'll be at The Natural History Museum all summer. Earth from the Air is a collection of photographs by French Photographer Yann Arthus Bertrand. He's flown over 76 countries to capture astonishing images of the natural world showing what an impact people have made on the world they live in and taking photos of extraordinary natural phenomena. Take a birds eye view of the Amazon, the Sahara Desert, the African bush or zoom down over some of the great cities of the world. The exhibition - which is FREE TO VIEW - will be in the gardens of The Natural History Museum in Kensington, London all summer from June 20th. It'll be a great day out for families. And where else can you say you went for a day out... and saw the whole world!!! There'll be over 150 giant sized images (almost 2 metres tall) on display, complete with an easy to follow story about each photo in the show. It is an exciting way to see what a wonderful, exciting world we live in. It includes pictures from Antarctica, Africa, Asia and America all taken from a helicopter. They tell a fantastic story. Having flown over the world, you can then walk all over it! We'll have a walk-on map of the entire globe, so you can see where you live, where you might have been on holiday - and where the amazing pictures in the exhibition have been taken. After a very busy first week, the overwhelming popularity of Earth from the Air has prompted the Museum to extend opening hours to 10pm every night of the week throughout the summer. From June 28th, the east gardens of the Natural History Museum, where Earth from the Air is showing, will stay open until 22.00 whilst the rest of the museum closes at 6pm. It means the exhibition can become a location for people to meet before going on to restaurants, concerts or clubs  and will bring a continental feel to London this summer. The exhibition has been specially designed with lighting to allow opening into the evenings and in other cities it has even remained open all night. Mike Paskin, Project Manager for Earth from the Air at The Natural History Museum comments: "The Natural History Museum has been thrilled by the overwhelmingly positive response to this exhibition, which is attracting visitors of all ages. By extending our opening hours, well be giving even more people the chance to enjoy Yann Arthus-Bertrands amazing photographs. The Museums gardens are a lovely spot to relax after work, enjoy a summers evening and see Earth from the Air as the photographer intended  outside." BBC4, the digital channel, has commissioned a documentary about Yann Arthus-Bertrand. Produced by Cassie Farrell from the BBC Bristol Features Unit, the 60 minute documentary will follow the photographer during the launch of the London exhibition. Other locations will include Lebanon, when Arthus-Bertrand will be filming for a new aerial photography project and Samara in Russia, where a special exhibition will be built in July. It is scheduled to be screened in late August/early September. Celebrated French aerial photographer, Yann Arthus-Bertrand, today spoke about his commitment to change opinion about the future of the natural world at the opening of Earth From The Air: a photographic portrait of our planet, The Natural History Museums first outdoor exhibition. People seeing the exhibition can see that from a birds eye view the world is a beautiful place. Close up, it is clear there are serious problems and these are powerfully illustrated by the stark facts and statistics presented in this exhibition. Together they show why we should be concerned about the state of the world, said Arthus-Bertrand at todays exhibition launch. A free exhibition, Earth from the Air includes 150 aerial images  each over two metres across  capturing the characteristics and patterns of the natural world from a unique aerial perspective. Arthus-Bertrands stunning photographs are presented in an ideal setting, making use of the natural light and open space of The Natural History Museums east garden. Children can walk all over the world on the giant walk-on world map, perhaps recounting family overseas holidays and describing the animals, plants and landscapes they would expect to see as they step from country to country. Arthus-Bertrand said Earth from the Air, which presents his photographs alongside descriptions of each location together with information about the use of the planets resources and global development, is intended to challenge visitors to look beyond the visual images into the issues they raise about the planets health. For me the biodiversity of the planet is really important. It is disappearing at an alarming rate and we all have a responsibility to protect it. I believe we should adopt sustainable ways of living that are good for man and nature. Its vital for future generations, continued Arthus-Bertrand. Arthus-Bertrand, who has been awarded the Legion DHonneur for his environmental work, has spent almost ten years taking aerial photographs of natural and man-made landscapes and features. He has taken over 100,000 shots, travelled over 100 countries and clocked up more than 3,000 flying hours by helicopter. The result is a unique visual record of the state of the planet today. Earth from the Air has attracted record crowds and critical acclaim when it was shown in Paris, Copenhagen, and other major cities. So far it has been seen by close to 10 million people. The organisers in the UK, wecommunic8 and Impact Photos, are delighted to have the support of The Natural History Museum as the exhibitions first UK venue. Providing a magnificent backdrop to the photographs, The Natural History Museum also shares Arthus-Bertrands wish to highlight the pressing need to conserve Earths biodiversity. The gardens of The Natural History Museum will this summer host a free photographic exhibition, Earth from the Air  A Photographic Portrait of Our Planet, by celebrated French aerial photographer Yann Arthus-Bertrand. This astonishing photographic project is a visual record of the state of our planet today. Arthus-Bertrands Earth from the Air exhibition opens to the public on 20 June. It has taken 10 years of research and fieldwork to produce, in which time Arthus-Bertrand has taken over 100,000 shots and clocked up more than 3,000 flying hours, travelling across 100 countries. The images, all aerial photographs, capture the characteristics and patterns of the natural world which can only be seen from a birds-eye view. The Museums first outdoor exhibition, Earth from the Air will include 150 images  each over two metres across  and a giant walk-on map of the world. With great consideration to Arthus-Bertrands vision for the exhibition, the stunning photographs will be presented making use of the natural light and open space of The Natural History Museums east garden. Earth from the Air has attracted record crowds and critical acclaim when it was shown in Paris, Copenhagen, and other major cities. So far it has been seen by close to 10 million people. The organisers in the UK, wecommunic8 and Impact Photos, are delighted to have secured The Natural History Museum as the exhibitions first UK venue. Providing a magnificent backdrop to the photographs, The Natural History Museum also shares Arthus-Bertrands wish to highlight the pressing need to conserve Earths diversity. 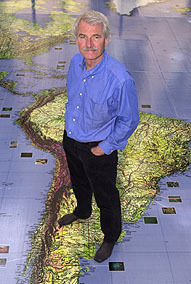 Yann Arthus-Bertrand said "I think its great that Earth from the Air is coming to London. Its an important city for me and with the Earth Summit coming up soon, this exhibition will allow visitors to reflect upon our future and understand the importance of preserving our planet." Preparations for the staging of the EARTH FROM THE AIR exhibition at The Natural History Museum are now in full swing following the approval of an application for planning permission by the Royal Borough of Kensington and Chelsea. Special permission was necessary to allow the exhibition to be staged in the east gardens of the Museum. The pictures, which are all being printed on weatherproof materials in Paris will be arriving in the UK this week and will be erected on large exhibition frames over the weekend of June 15th and 16th. A walk-on map of the world, a popular feature at other EARTH FROM THE AIR exhibitions, will be built on site out of 64 separate pieces and mounted on a low plinth measuring 9m x 16m in size.